The Steelmen arrived in North Korea with a strong advantage from the first leg and look well set to complete the job. 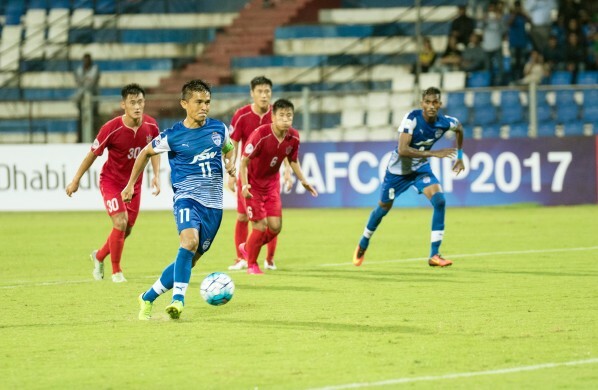 The 2016 AFC Cup finalists, Bengaluru FC, will be aiming to complete the job they began as they take on North Korea's April 25 SC (4.25 SC) at Pyongyang on Wednesday. The Blues hold a sizeable 3-0 advantage from the first leg thanks to goals from Sunil Chhetri, Udanta Singh, and Lenny Rodrigues. They will be facing a 4.25 SC side that looked extremely comfortable on the ball in the opening minutes of the game in Bengaluru but were made to look inferior once the hosts had taken the lead. They will need to pull off a performance of a lifetime if they are to entertain any hopes of overturning this deficit and moving to the next round. 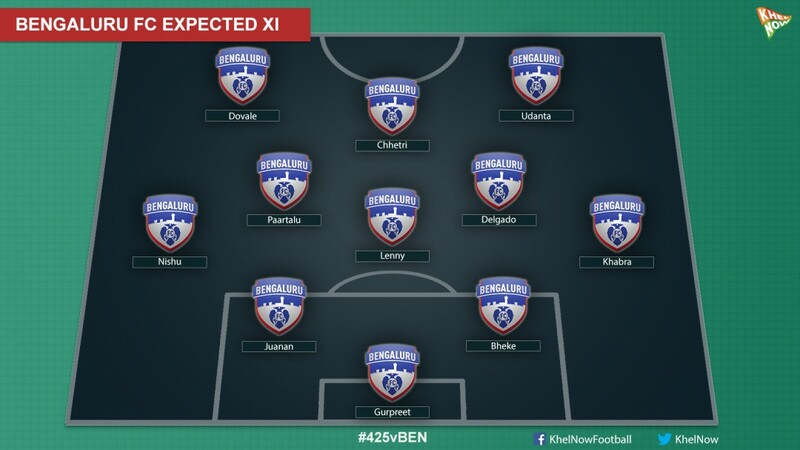 Albert Roca nearly all of his new recruits a start in the first leg at Bengaluru to good effect. Gurpreet Singh Sandhu, Rahul Bheke, Erik Paartalu, Dimas Delgado and Antonio Dovale gave a good account of themselves on a rain soaked night at the Garden City. Gurpreet, in particular, was imperious in goal as he returned to India after a fruitful spell in Europe. Roca will no doubt be looking to not take his opposition lightly and will be aiming to field the same 11 when they take to the pitch in Pyongyang. Roca has orchestrated a change in the way Bengaluru play from a counter-attacking unit to one that is extremely patient in possession and look for the killer opening on their way to goal. The team begins in a 4-3-1-2 shape which morphs fluidly into a 3-4-1-2 while going forward. High-intensity fullbacks in the form of Nishu Kumar and Harmanjot Khabra will be key to provide the width for the team as they overlap with Toni Dovale and Udanta on their respective flanks. The pair will also be expected to take the attack into the opposition box. Erik Paartalu and Dimas Delgado took time to settle into their roles in the first leg but grew in stature as the game progressed and were seen making late runs into the box as the Blues churned out chance after chance. They will be expected to perform a similar role at Pyongyang. Lenny Rodrigues has performed the role of a quasi-center half to perfection as his positioning in between Juanan and Rahul Bheke allows for a solid defensive foundation to be present giving the attacking players greater freedom. A large portion of the creative burden will lie on the shoulders of Sunil Chhetri who has moved back to his preferred roving role where he has been given full freedom to cause havoc among the opposition defense. His deeper positioning allows him to see more of the ball and pick Udanta and Dovale's inward runs into the box. The home side, on the other hand, will need to go for broke and may play a highly attacking lineup in the quest to overturn their deficit. Kim Yu-Song, who did not start the first leg in Bengaluru thanks to a back strain, will no doubt be among the starters for this crucial game. The 24-year old is one of the most highly rated stars of North Korean football and will need all his big game experience to help his side beat Bengaluru. Midfielders Ri-Hyong Jin and An Il-Bom gave Bengaluru a few nervy moments with their combination play from open play and set pieces and will be crucial towards their team's chances of progressing. Sunil Chhetri-Bengaluru FC: The cheeky Panenka he used to open the scoring in the first leg typified the confidence that runs through him now. The 32-year old has been reborn in his new role under Roca and will be the key element in inspiring his team to the next round of the AFC Cup. Ri Hyong Jin-4.25: Despite Kim Yu-Song's highly probable restoration to the starting 11, it was Ri Hyong-Jin who rattled a few nerves in the first leg. His ability to pick a pass and set piece ability were on full display in India and 4.25 SC will need more of this as they look to overturn a seemingly impossible deficit. "It would have been ideal to arrive a little earlier which would have given our boys enough time to get used to the conditions. But it is what it is. We want to hit the ground running and I hope it turns out to be a good experience." The game is not live on TV. You can follow live streaming of the game on AFC Cup Facebook Page.